Increase in growth, reducing operational cost, increasing customer satisfaction and effective use of technology for competitive differentiation are top priorities for management today. Suncom’s team of consultants enhances the alignment of enterprises through improved process efficiency, reduced cost and enriches business value of IT. 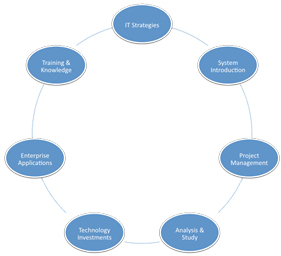 Our team focuses on bringing together key IT Consulting Services that address such aspects and transform enterprises. Our Consulting offerings are based on an analytical approach to understand the problems and to bridge the gap. Our value proposition is based on a cross industry business knowledge, deep hands-on technology skills and a focused approach. Starting with an understanding of the business need, we then work with our clients to design and deliver efficient IT Services, bridging the gap between leveraging what they have and delivering what they need. We help our clients in building a high performance IT organization through formalizing the IT strategy, business processes, technology needed to deliver and manage efficient, high quality IT services.